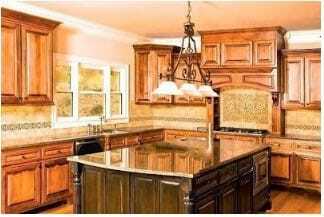 Your Kitchen is the most essential and costly room to renovate in your home. You should carefully plan your kitchen renovation to reflect your style and personality. Your kitchen has to be comfortable, enjoyable, practical and most of all functional. Establish your budget, your personal needs and your preferences to determine how much change in your kitchen can be achieved. Put function first when planning your kitchen renovation. Consider these material qualities for your kitchen renovation: Wear resistance, durability, heat resistance, ease of maintenance, texture and appealing color. Consider the overall style of your home when selecting your kitchen cabinets. Kitchens can be designed in diverse styles that complement the style, color scheme and theme of your home. Some popular kitchen design styles include country, traditional, contemporary, Tuscan, rustic, French, Spanish, eclectic and cottage. 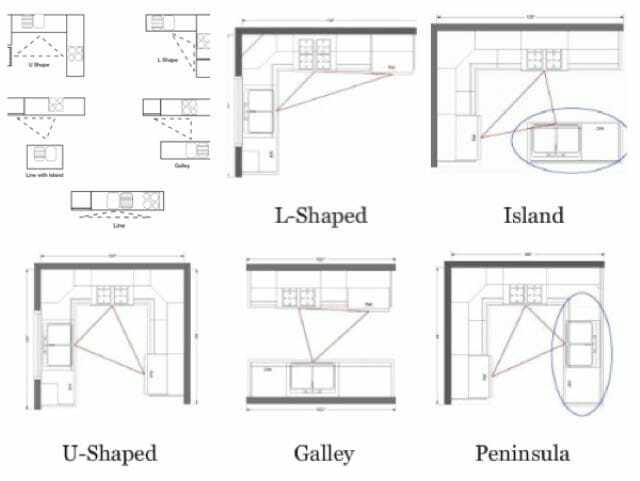 Consider your kitchen’s layout such as Galley, Line, L- Shaped, U- Shaped and L- Shaped with Island. Design a layout that has good space planning, is safe and is functional (no appliance or cabinet doors should interfere with each other). Make sure your kitchen layout contains the three primary kitchen workstations to meet your basic functional needs: a fridge for food storage, a cook top surface for food preparation such as cooking and a sink for clean up and waste disposal. The linear distance between these workstations is called the kitchen “work triangle”. 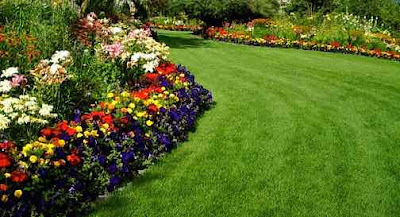 Ideally the perimeter of the work triangle should be between 15 and 22 feet in total length. Ideally the distance between the sink and the cook top should be between 4 to 6 feet in length (the shortest line in your triangle). The desirable distance between the sink and refrigerator is between 4 to 7 feet and between the cook top and refrigerator 4 to 9 feet. 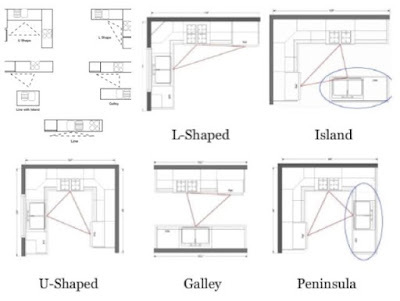 The goal of a work triangle in kitchen design is to design a layout that promotes reasonable, suitable, well-organized and efficient interaction between all three workstations. Consider a two level kitchen island for food preparation and seating. Make sure to leave a minimum of 3 feet of space on all sides of the kitchen island. Consider deep drawers and pullout shelves for your lower cabinets; to make the most of your storage space and for easier access to pots and pans. Design your overhead cabinets right up to the ceiling to maximize storage and to create a high-end look. 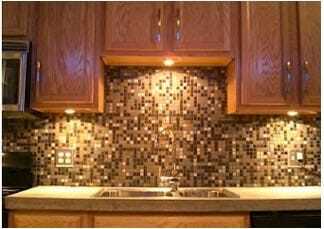 Install under-cabinet lights to provide lighting on kitchen countertops. 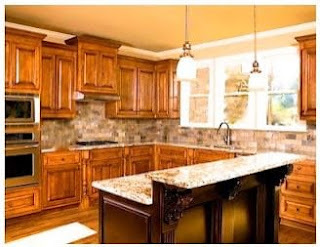 Use wood veneer for cabinet interiors. It is more durable than laminate or MDF. Consider durable, non-porous, heat resistant and easy to clean kitchen countertop materials such as quartz, marble or granite. Replace your old kitchen appliances with newer energy efficient models. Consider the color scheme and materials in adjacent rooms if your kitchen is open-concept. Adding glass doors to your upper kitchen cabinets instead of solid wood is an easy way to give the space an attractive look and to add visual interest and style. Include open shelving in your kitchen renovation. Open shelves decrease visual weight. Pick durable and stain resistant flooring such as cork or tile for your kitchen flooring. Replace the old lighting fixtures in your kitchen with brighter and more energy-efficient ones. Add new stylish backlashes to help increase your kitchen's appeal, to bring in color and to create a focal point. 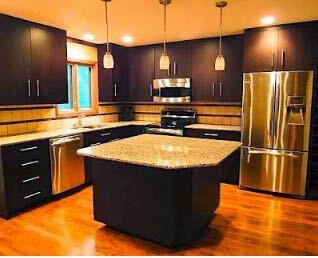 Use eco-friendly materials in your kitchen renovation such as cork or bamboo flooring. Get kitchen design ideas from magazine photos, kitchen showrooms, books and TV shows. Be sure to choose water efficient faucets for your kitchen to reduce water consumption. Add a Lazy Susan to your kitchen corner cabinets to make them more functional. Every real estate professional will tell you that renovating and updating your kitchen provides a good return on your investment and will increases the value of your home. By following these kitchen renovation ideas and tips you will add style and function to the heart of your home.